Wade Wilson returns in Deadpool 2 for some wicked jabs at Wolverine, Marvel and much more in a sequel that’s chock-full of easter eggs, jokes, secret cameos, and meta-moments. To find out all the details, check out my video below where I break down the very best easter eggs and references you might have missed in the movie! 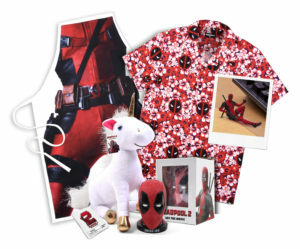 And to celebrate the release of Deadpool 2 this week, we’ve got 2 amazing merchandise packs to give away – watch our video for more info! The competition ends at 23:59 on 8 June 2018. Each prize consists of Computer Buddy, Unicorn, Apron, Swear Jar, Hawaiian Shirt.